Lilly and her mum Carly, who is being treated for cancer at Blacktown Hospital. 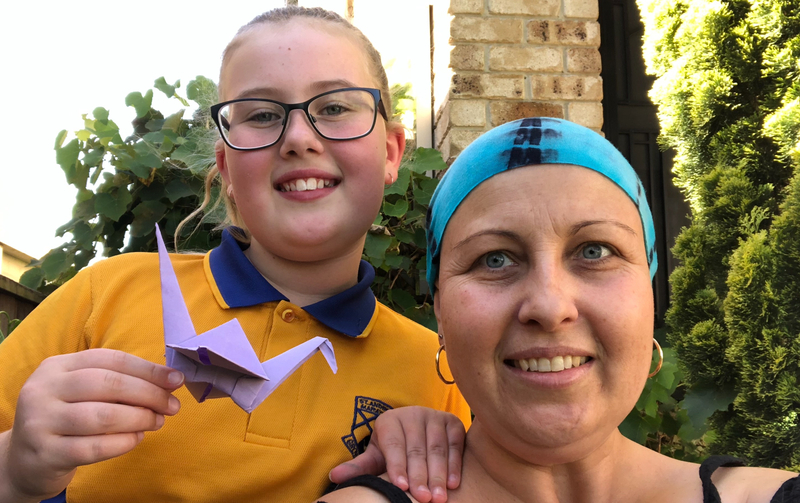 Ten-year-old Lilly was inspired to help after visiting Blacktown Hospital while her mother Carly Bayrich had a cancer check-up. As a crafts and origami enthusiast, Lilly noticed a sign encouraging people to create 1,000 paper cranes for a World Cancer Day installation. “I was at Blacktown Hospital with my mum because she was having a blood test because she’s got cancer,” Lilly said. “There was a box to put paper cranes in because they were trying to make 1,000 paper cranes, so I made some. “It took me two to four days to make about 120 cranes. For me it wasn’t really that hard. “I did it for everyone at the hospital because I knew that they were making a wish for all people with cancer to get better. Staff with the paper cranes at Blacktown Hospital on World Cancer Day. Lilly was pleased that administration officer Kim Norris made a special paper crane to say thank you for Lilly’s efforts. “Kim made me a tiny one to say thank you. It was so cute. Thank you,” Lilly said. Carly Bayrich, whose family is from the Woodcroft area, is 43 and receiving treatment for ovarian cancer. “I was diagnosed with stage 2 ovarian cancer in October. As Lilly is my oldest child it has been a big thing for her,” Carly said. Carly said Lilly lined all of her paper cranes on the stairs and called her to surprise her with them. “Lilly loves origami so it’s one of the things she loves doing,” Carly said. Carly was complimentary of her care at Blacktown Hospital. “I started treatment just before Christmas and I’ve got two more cycles to go. Things are looking good,” Carly said.